A short form show with an abundance of noses! A cadavre exquis of scenes, objects and word games, played with nonsense and a bit of surreal vibe. Artistic direction, construction and puppeteers: Luís Vieira and Rute Ribeiro Adaptation and texts: Rute Ribeiro Executive production: Daniela Matos Photography: Alípio Padilha Support and partnerships: Câmara Municipal de Lisboa, EGEAC Company sponsored by: República Portuguesa - Ministério da Cultura / DGArtes Technique: Paper figures and objects Language: Portuguese For audiences over: +8 Running time: 40 min. approx. "This is not Gogol's nose but it could be... with a dash of Jacques Prévert" - The relevance of having a nose, of not getting one's nose out of joint, of not sticking one's nose where it does not belong, of being toffee-nosed or just being nosey! And what about Jacques Prévert? "To tell you the truth, he doesn't look like anyone." A short form show with an abundance of noses. A cadavre exquis of scenes, objects and word games, but always with a lot of nonsense, where the surreal world surrounding us is present. We do not know what epoch this pair belongs, but it seems they are lost in time. They seem to have the power to move the world and manipulate their leaders... They use words as if they were in a game of chess and messing everything. Where are they? In an abandoned campsite or in a decadent amusement park, but with a lot of glitter and full of objects and images? Unusual and hilarious situations follow each other, between the lines we notice the references of this rotating wheel of absurd numbers. But at the end it seems to have the meaning of the world that we are living in, i.e., it doesn't make any sense. Reality has surpassed fiction. And the most important? The ability to laugh at ourselves and the possibility of reinventing ourselves. "Even if happiness forgets you a little bit, never completely forget about it." 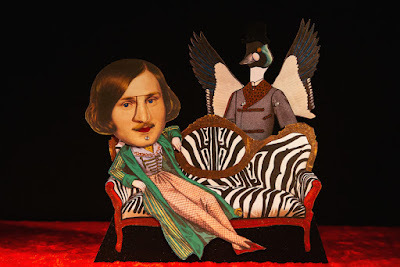 “It is with articulated and very funny paper puppets that A Tarumba makes the show This is not the Gogol's Nose, but it could be with a small touch of Jacques Prévert, a journey through the populist bestiary of contemporary politics with a kitsch touch (...). In this miscellany of noses, authors, quotations, Russian and French songs, there are plenty of other paper characters. 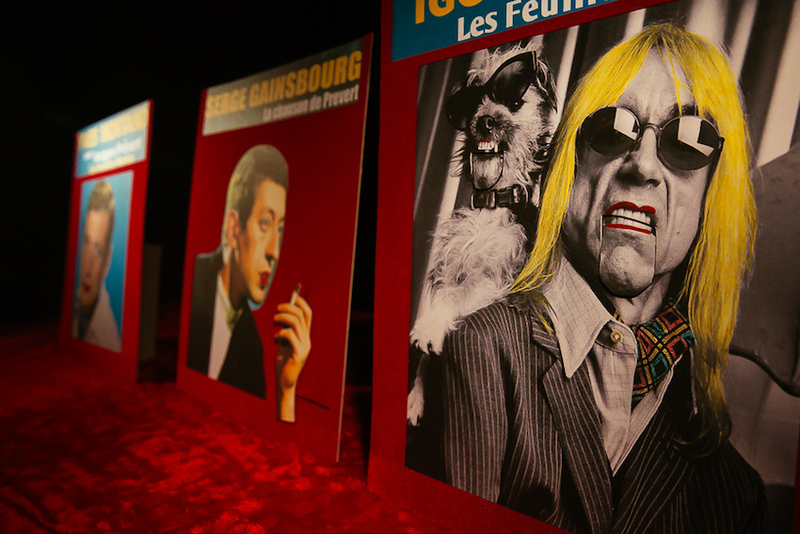 From Juliette Gréco to Camões passing by Iggy Pop, Serge Gainsbourg or Ives Montand, whose voices come from an old record player placed there, right in front of us. Let us go to this universe related to the Prévert - from Moulin Rouge, free love and freedom, which are a counterpoint to the times in which we live. There is even a populist bestiary. "What all these authors have in common, in addition to talent? An enormous creative freedom, a taste for the absurd and the random, an almost surreal frequent tone, a strong poetic density. 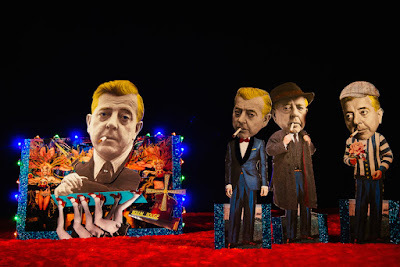 Rute Ribeiro and Luís Vieira, which together form A Tarumba - Marionetas e Formas Animadas and a grain of permanent madness and nonsense - have not resisted having these authors as a source of inspiration for a show that doesn't recreate none of their works, but which, structured in the spartan rule of the cadavre exquis, refers to them and honours them permanently, even when it is lggy Pop, Barack Obama or any other feline that takes the reins of a universe, that shamelessly and bluntly, has the Great Russia as background and it is, as it is part of contemporary general knowledge, dominated by blondes". A Tarumba - Teatro de Marionetas is a Portuguese professional theatre company, created in 1993. It aims to spread and promote puppet and visual theatre. Tarumba means to be confused or perplexed, astounded, fascinated, stunned, astonished… and expresses how the company generally envisions puppetry art. 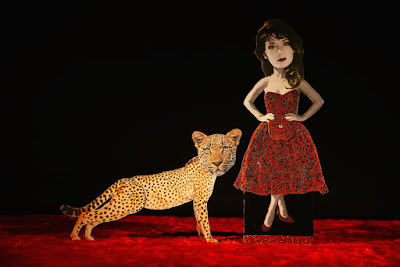 The artistic project comprises: creation and artistic experimentation; the International Festival of Puppetry and Animated Forms - FIMFA Lx organization; training and research with the creation of a Puppetry Arts Centre | Centro de Artes da Marioneta - CAMa. Since 2001, A Tarumba organizes annually the International Festival of Puppetry and Animated Forms - FIMFA Lx. The company received the Critics Award 2010 given to FIMFA and the artistic directors, Luís Vieira and Rute Ribeiro, received the Personality Award 2013, by their work on the festival. The company has been performing all over Portugal and abroad in many international festivals: (France - Festival Mondial des Théâtres de Marionnettes de Charleville-Mézières 2013 – Programme IN, Denmark, Czech Republic, Brazil, Argentina, Spain, Slovenia, Slovakia, Pakistan, India, Hungary or United Kingdom), especially for an adult audience, with shows by Christopher Marlowe, Federico Garcia Lorca or Bertolt Bercht, among others. Besides the shows A Tarumba develops experimental workshops on puppetry arts, specifically for professionals, teachers or children, like, for instance, toy theatre or shadow workshops. During these 24 years of activity, Tarumba created an important artistic collection, consisting of puppets made by the company, for each play, old and ‘historical’ puppets, Toy theatres (originals from 19th century and beginnings of 20th century), theatre books, especially about puppet theatre, photographs, programs and posters that are present in the Puppetry Arts Centre - CAMa, created by the company in 2007, and where A Tarumba also develops the Project Funicular - a training program of international workshops.